If a business is experience rated, a completed Experience Rating Form (also referred to as an Experience Rating Worksheet) is provided to its insurer when a policy is written. A completed Experience Rating Form provides detailed information about the classification codes assigned to a policy by the WCIRB, the payroll reported for each of those classifications, summaries of claims amounts, and the experience modification. Typically, copies of this form are available by contacting your insurer or insurance professional. A policyholder may obtain a copy of its experience rating form once per year at no cost. (See Experience Rating Worksheet Request for details.) Obtaining an Experience Rating Form is the best way for a company to see the data that the WCIRB has on file. 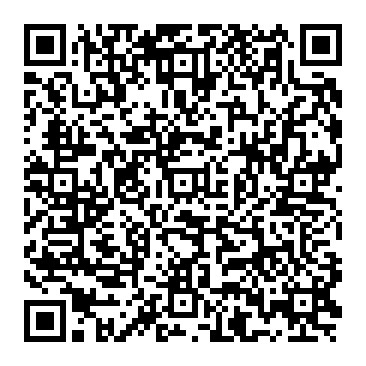 Click on a number in the image below to read more about that section of the Experience Rating Form. Please note: The sample data in the form below is intended for demonstration purposes only and should not be deemed as accurate. This section of the Experience Rating Form contains the information necessary to identify the employer, the insurer and policy, and other information pertinent to the application of the experience modification. Appearing below the company name and address are the classifications (other than 8810, Clerical Office Employees, and 8742, Salespersons-outside) that have been assigned to the company by the WCIRB. The effective date of the experience modification will normally correspond with the effective date of the policy. If, however, the employer's policies have not incepted on the same day every year or if a correction to an experience modification has been issued, or the operations are covered by more than one policy with different coverage dates, the effective date may differ from the policy inception date. This is the date that the worksheet was originally released by the WCIRB to the insurance company. The worksheet shows the insurer, insurer group, policy number and issuing office. Payroll and loss information on the worksheet is grouped by policy. The insurer code for the insurer who wrote the policy and the policy year is shown above the payroll and claims information for that policy. For information about the insurer codes used by the WCIRB, see WCIRB Insurer Codes. The classifications listed on the Experience Rating Form represent the operations of the business during the experience period. The worksheet shows the payroll by classification code, reported for policies beginning within the experience period. Payroll is associated with the year in which your policy began, not necessarily the year in which it was paid. For example, for a policy that is in effect from December 31, 2011 to December 31, 2012, the payroll is reported for 2011, even though most of the payroll is earned in 2012. The Expected Loss Rate reflects the anticipated average cost of benefits, per $100 of payroll, for a classification during the experience period. Expected Loss Rates are subject to change yearly. For example, the 2011 Expected Loss Rate for Classification 3632, Machine Shops, is $1.52. In other words, for every $100 of payroll, the average cost of benefits resulting from workplace injuries assigned to Classification 3632 during the experience period was $1.52. The Expected Loss Rates can be found in the Publications and Filings section of the WCIRB website. Expected Losses are determined by multiplying total payroll (per $100) for each classification by the Expected Loss Rate. This amount reflects an estimate of the cost of losses expected to arise during the experience period for your company based on the payroll reported for each classification. The Discount Ratio (D-Ratio) is the mechanism used to divide Expected Losses into Primary and Excess amounts. See "Expected Primary Losses" below. The difference between the D-Ratio for each classification reflects differences in the severity of claims by classification. In other words, the severity of the average claim for some classifications is significantly higher (indicating a more severe injury) than that of the average claim found in other classifications. The D-Ratios is subject to change yearly. D-Ratios can be found in the Publications and Filings section of the WCIRB website. Total Expected Losses and the Primary Expected Losses is the Expected Excess amount. The Expected Excess is the difference between the total Expected Losses and the total Primary Expected Losses. This number represents average excess losses expected for similar-sized employers within your classification. This column shows the claim number(s) reported by the insurer. Claims under $2,001 are usually grouped together to save space on the form. If claims are grouped, the number in the Injury Type/# of Claims column will show the number of claims that have been grouped. This column shows the injury type codes assigned and reported by the insurer. This detail does not affect the experience modification calculation; it is for informational purposes only. Injury type codes are found in Part 4, Section V, B. Loss Data Elements, Rule 3 of the California Workers' Compensation Uniform Statistical Reporting Plan - 1995. This column indicates whether or not the claim was reported as Open or Closed when the claim was last valued. This detail does not affect the calculation. It is for informational purposes only. Actual Losses shows the total claims value (medical and indemnity) as of the last valuation date. For information about claim valuation dates, see Unit Statistical Reports. Actual Losses are totaled for all claims. The first $7,000 of a claim's value is the Actual Primary Loss amount. (Any remaining amount is Excess.) Claims under $2,001 are grouped together to save space on the form. Actual Primary Losses are totaled and this figure is subtracted from the Actual Losses to determine the Actual Excess amount. Actual Excess Losses is the difference between the Actual Losses and the Actual Primary Losses. Actual Excess amounts represent the portion of your claims that exceed the Actual Primary Losses. Various expected and actual loss columns are totaled. These amounts represent the totals for the experience period and will be used in the experience modification calculation. The bottom portion of the worksheet shows the experience rating formula with each of the values necessary to complete the calculation. For multi-page worksheets, the calculation is shown only on the final page. The weight given to Actual Primary Losses in the experience modification calculation. It is a function of Total Expected Losses and is subject to change yearly. Credibility Primary values can be found in the Publications and Filings section of the WCIRB website. The weight given to Actual Excess Losses in the experience modification calculation. It is a function of Total Expected Losses and is subject to change yearly. Credibility Excess values can be found in the Publications and Filings section of the WCIRB website. This is the experience modification that is the product of the experience rating calculation shown on the form. It is effective as of the Effective Date shown at the top of the worksheet. The Loss-Free Rating is the experience modification that would have been calculated if $0 (zero) actual losses were incurred during the experience period. This hypothetical rating calculation is provided for informational purposes only. Once the WCIRB determines a business is eligible for experience rating, its experience modification is calculated by comparing the actual losses to the expected losses. Actual losses are the medical and indemnity claim costs resulting from a work-related injury, that an insurance company has paid or expects to pay in the future. Expected losses represent a business's projected losses for the industry in which it operates. In other words, given its classifications and payroll, its expected losses represent the statistical average losses that a business of a similar size in the same industry is expected to incur. Given two businesses within the same industry, the larger the business, in terms of payroll, the more losses that business is expected to incur. In simplest of terms, an experience modification compares actual losses to expected losses. In practice, some elements have been added to the experience rating formula to prevent extreme swings in experience modifications from year to year. To understand these elements, it is necessary to explain the experience modification calculation in some detail. It is relatively straightforward to predict the frequency and cost of workplace injuries for a large group of businesses by examining the losses incurred by those businesses in the past. Predicting whether or not a specific business within this large group of businesses will experience a workplace accident, however, is more difficult. This is especially true for small businesses. The statistical chance of incurring a workers' compensation claim for any single small business within a large group is small, and an experience modification based on this loss history is less reliable than it would be for a large business. For a small business that incurs a loss, the effect on its experience modification using a simple comparison of actual losses to expected losses would result in an unreasonably high experience modification for the year. This could result in greatly increased workers' compensation insurance costs. 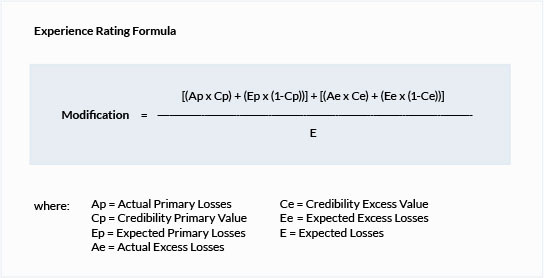 In order to improve the statistical credibility of a business's experience in the experience modification and to restrict the fluctuation of a business's experience modification from year to year, several adjustments are made in the experience rating formula to modify the expected losses and actual losses for those businesses whose experience is not fully credible. Actual losses are segregated into actual primary losses and actual excess losses. The first $7,000 of losses for a claim are considered primary losses. Any remaining amount above $7,000 is considered excess losses. Once segregated, the experience rating formula places additional weight on the primary portion. This additional weighting of primary losses places more weight on claim frequency than on total claim cost, or severity and limits somewhat the impact of claim severity in the experience rating calculation. The second adjustment is the inclusion of primary credibility and excess credibility in the experience rating formula. Taken together, these credibility values represent the weight given in the experience rating formula to a business's actual loss experience. Larger businesses tend to have more weight (more credibility) given to their actual experience while smaller businesses tend to have less weight (less credibility) given to their actual experience. (Prior to January 1, 2012, the experience rating formula used "B and W" values to reflect credibility.) The credibility values used in the experience rating formula can be found in the Publications and Filings section of the WCIRB website. Without these adjustments, experience modifications would be far more volatile from year to year. These factors are shown in the formula below, and are explained in the Experience Rating Form section. Certain types of claims, such as joint claims, subrogated claims, and death claims, impact the experience modification calculation differently from other types of claims. For details concerning these exception cases, see Part 4, Section V, Subsection C of the California Workers' Compensation Uniform Statistical Reporting Plan - 1995. A joint claim is one in which it has been determined by adjudication that a workplace injury is covered by more than one policy. Such claims usually result when the injured worker has co-employers, there is overlapping coverage on the same employer, or the injury developed over an extended period. A subrogation claim is a claim where an insurer has received monetary reimbursement either in part or in whole under subrogation rights. Death claims that are solely related to employment are valued at an average death amount that is listed in Table III, Credibility Primary and Credibility Excess Values which is available in the Publications and Filings section. The average death value may be modified if the death is not solely related to employment. The data used to calculate your experience modification is determined by your company's anniversary rating date. The inception date, or start date, of your policies determines your company's anniversary rating date. For example, if your policies always start on January 1, your anniversary rating date would be January 1. If you have switched inception dates or if you have multiple concurrent policies with varying inception dates, determining your anniversary date may be more complicated. Your insurance professional can help you determine your anniversary date. 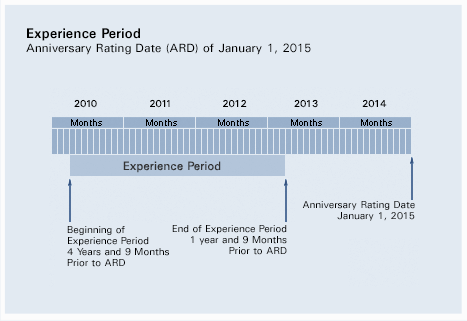 Your anniversary rating date determines the experience period and the effective date of your experience modification. In most cases, all payroll and losses developed under any policy beginning within this period will be used in determining your experience modification. The experience period begins four years and nine months prior to your anniversary rating date and terminates one year and nine months prior to the anniversary rating date. If your anniversary rating date is January 1, 2015, the experience period is April 1, 2010 to April 1, 2013. Shown below is a table of experience periods for anniversary rating data throughout 2015. Data, including losses and payroll by classification, resulting from every workers' compensation insurance policy written in California is reported to the WCIRB in a Unit Statistical Report (USR). These reports, submitted by your insurance company, are the source of the data used by the WCIRB to administer the Experience Rating System and to publish experience modifications. When a worker is injured on the job and a workers' compensation claim file is opened, an estimate of the total claim value (present and future) is made by your insurer and is included on the next unit statistical report for your policy filed with the WCIRB. USRs are reported at specific intervals defined in Part 4, Section I of the California Workers' Compensation Uniform Statistical Reporting Plan - 1995 (Uniform Statistical Reporting Plan). The first time that a claim is valued for unit statistical reporting is 18 months after the policy inception month. This 18-month value is reported on a "first level" Unit Statistical Report, which must be submitted to the WCIRB 2 months after the valuation date, or 20 months after the policy inception month. Claims that are still open as of the first report are required to be valued and reported again 12 months later (30-month valuation, due into the WCIRB at 32 months after the policy inception month) on a "second report." This process continues either until all claims are closed or for a total of 10 reports. Typically, only data contained in the first 3 reports is used for experience rating purposes. Employers wanting to self insure their workers' compensation liabilities must apply to the Office of Self Insurance Plans (OSIP) for approval. The private sector application process for a new employer (not currently self-insured in California) takes about thirty (30) days from initial properly completed application to issuance of certificate of authority to self-insure. During that period, OSIP evaluates the application to determine the applicant's financial strength, proposed benefit delivery system, and suitability to participate in self-insurance. Average net profits of $500,000 per year for the last five years. Certified, independently audited financial statements. Each subsidiary or affiliate company of a private applicant must file a separate application to become self insured. They may apply with the parent company or individually, and the same application form is completed by the subsidiary/affiliate. Group self insurance by non-affiliated companies is permitted under California regulation, for both private and public sector employers. During 2001, group self insurers began forming in the private sector for the first time. The first such application was approved effective January 1, 2002. Current regulations permit existing private self insurers of net worth over $10 million to add new subsidiary or affiliate companies with an application for an interim certificate. This provides immediate self insurance for the new subsidiary/affiliate company and is valid for 180 days. During the 180-day period, a three-page application for a permanent certificate must be filed and approved prior to the expiration of the interim certificate. Visit the DWC Website, Office of Self Insurance Plans (OSIP). Self insured employers are required to provide the same scope of benefits as an insurance company. Claims must be adjusted in California, and new self insurers are required to use a licensed third-party administrator for their first three years of self insurance. After that time, self administration may be permitted. Everyone, both insurers and self insurers are subject to audits by the Division of Workers' Compensation to verify that benefits are promptly and properly paid to injured workers. Self insurers are also subject to periodic audits by OSIP to verify the accuracy of claims reserving practices and the correctness of the reported workers' compensation liabilities. OSIP certifies individuals handling workers' compensation claims by means of an administrator's exam given throughout the year. A third-party claims administrator agency or company must also be licensed with OSIP to handle self insured claims. OSIP requires an evaluation of the new applicant's injury and illness prevention program. A compliance inspection by a private, independent, registered professional safety engineer, certified industrial hygienist, or certified safety professional is part of the application process. At minimum, the applicant must be in compliance with Cal/OSHA safety and health regulations. Once the application for self insurance has been approved, the self insurer is required to meet specified annual obligations. The Self Insurers Security Fund with arrange and guarantee the collateral deposit requirements based on meeting credit standards for many self insurers. For those that do not meet the Fund’s credit standards, these self insurers are required to directly post their collateral security deposits with OSIP. Self insurers are required to annually submit to OSIP and actuarial study, employer’s annual report and a copy of their audited financial statements. The actuarial study determines the ultimate exposure of the self insurer’s workers’ compensation liabilities. The audited financial statements are used to determine minimum financial eligibility to be self insured. For more information on the Self Insurers Security Fund, Please visit their website at Security Fund. Q. What happens if I’m uninsured and an employee is injured? A. Failing to have workers' compensation coverage is a criminal offense. Section 3700.5 of the California Labor Code makes it a misdemeanor punishable by either a fine of up to $10,000 or imprisonment in the county jail for up to one year, or both. Additionally, the state issues penalties of up to $100,000 against illegally uninsured employers. If an employee gets hurt or sick because of work and you are not insured, you are responsible for paying all bills related to the injury or illness. Contact the information and assistance officer at your local DWC office for further information. You should be aware that workers’ compensation benefits are only the exclusive remedy for injuries suffered on the job when you are properly insured. If you are illegally uninsured and an employee gets sick or hurt because of work, that employee can file a civil action against you in addition to filing a workers’ compensation claim. A. The Uninsured Employer's Benefit Trust Fund (UEBTF) is a special unit within the Division of Workers' Compensation that may pay benefits to injured workers who get hurt or ill while working for an illegally uninsured employer. The UEBTF pursues reimbursement of expenditures from the responsible employer through all available avenues, including filing liens against their property. Q. Can I be fined for not carrying workers' compensation insurance? A. Yes, you can be fined and more. If the Division of Labor Standards Enforcement (state labor commissioner) determines an employer is operating without workers' compensation coverage, a stop order will be issued. This order prohibits the use of employee labor until coverage is obtained, and failure to observe it is a misdemeanor punishable by imprisonment in the county jail for up to 60 days, or by a fine of up to $10,000, or both. The Division of Labor Standards Enforcement will also assess a penalty of $1,000 per employee on the payroll at the time the stop order is issued and served, up to $100,000 (Labor Code section 3722(a)). Additionally, if an injured worker files a workers' compensation claim that goes before the Workers’ Compensation Appeals Board and a judge finds the employer had not secured insurance as required by law, when the dispute is resolved the uninsured employer may be assessed a penalty of $10,000 per employee on the payroll at the time of injury if the worker's case was found to be compensable, or $2,000 per employee on the payroll at the time of injury if the worker's case was non-compensable, up to a maximum of $100,000 [Labor Code section 3722(b)]. Q. How do I get proof of coverage? Q. Where can I report an employer for not carrying workers' compensation insurance? A. You may report an uninsured employer to the nearest office of the Division of Labor Standards Enforcement. The offices are also listed in the state government section of the white pages of your local telephone directory under industrial relations, labor standards enforcement.